I post this pic here, not because of the violations ... but because of some other issues, that might very well make complying with the code an impossibility. This little gem controls the yard irrigation. I can imagine how the receptacle came to be mounted where it is ... opposite a receptacle inside the house. Placing it on the drive, up high like this, also ensures that it doesn't get hosed by the sprinklers. Some good points there. Yet ... let's imagine that one were to make this receptacle code compliant. First off, the mandatory 'bubble' cover will stick out of the wall much further ... presenting additional hazards. Nor will you find a cover with enough room to accept the 'wall wart' transformer. While I did not examine this controller for a UL listing, I would not be surprised if it were UL listed. It would also likely pass the NEMA 'rain test.' Perhaps an oversight on UL's part, but there is no UL requirement that the transformer fit in a bubble cover ... or that bubble covers be large enough to accept them! Nor do any of the codes, or standards, address the additional trim / impact hazard presented by large bubble covers. The house is also wired in knob & tube ... which brings up two additional details. 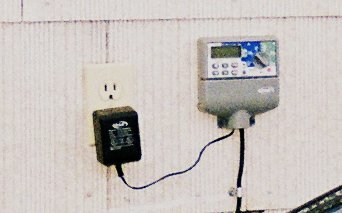 The older boxes, with their smaller dimensions, do not have room for a GFCI. You can -maybe- force one into the box, but the depth is limited ... and filled with soldered splices. Tear it down? Rewire? Sure, the homeowner would agree to that ... just remember - that's asbestos cement siding you're looking at. It seems that sometimes you just can't win! Are you SURE it is listed for outside mounting? In my very limited exposure to sprinkler controllers, most of them have been installed inside garages or other sheltered environments. Is the bottom of the enclosure threaded to accept cord grips or conduit fittings? Tell the HO they have to call a vinyl contractor when you're done. None of this solves the problem of the not-big-enough-for-the-wall-wart problem though. I speculate as to the listing, and the location. A large part of my speculation is based upon my knowledge of testing methods ... and the fact that everything after the transformer is low voltage. The underside of the unit has a knockout that can be used to attach conduit. The same firm makes units for hard-wiring (no wall wart); I assume they just used the same case on both products. FWIW, I find these "Virtual Rain (IIRC)" controllers to be both cheaper than, and superior to, the better known "Rain Bird" brand. Locating a receptacle in a passageway - as this one is - is always problematic. Probably the best solution there ... make a little 'dog house' over it, open at the bottom, with a front you can flip open. The result? Inside the box it would be a 'damp' location ... and depth would be as minimal as possible. Last edited by renosteinke; 02/10/08 12:36 PM. Mount the transformer in the roofspace or into the interior of the home (if allowed), extend the wires for the 24 volt supply from the wallwart to the controller-is this an option? Another option: mount the unit in the laundry of the house, covers all the waterproofing problems and easy to find a supply. Don't rule out the bubble cover just yet.. It might fit, depending on the size of the wall wart. I have used bubble covers with wall warts before, in places where I needed the wall wart to remain plugged in. For instance, I used one in the bottom of a podium. A bit of hard foam to fill the space between the wall wart and the cover serves to keep the wall wart from falling out as the podium is moved, and the cover prevents people from trying the use the outlet, as opposed to the other outlets provided. I might have used a single receptacle in that example. It was a smaller wall wart for a Littelite. Only solution is, use the proper sprinkler controller w/ a outdoor enclosure* or move it indoors like it should be.No need to use duct tape and silly putty fixes.